Single Phase Power Solutions introduced its Belle 100 HP single-phase electric motor, with Written-Pole® technology, that is ideal for applications where three-phase power is not available. The utility-friendly starting and operating characteristics provided through the use of Written-Pole® technology minimize voltage sags and flicker on long single-phase distribution lines. 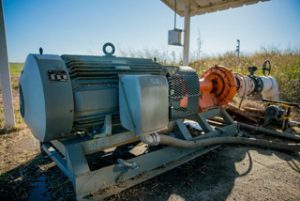 The motor features a totally-enclosed fan-cooled design in a cast iron frame that is suitable for indoor or outdoor installation, and demanding environments and applications. Rated as a 100 hp, 460 v, 1800 rpm electric motor, the innovative design delivers 95.5% efficiency at rated load with a near-unity power factor. The NEMA 449T frame motor weighs about 2,700 pounds and draws just 170 amps at full load. The motor windings are fabricated using high-grade copper and Class H insulation materials similar to those used in premium three-phase electric motors. The design eliminates brushes, slip-rings and internal rotary switches. The starting current draw is less than two times its rated full-load current. The low in-rush, soft-start design allows many high inertia loads to be started without overheating and support the capability for instantaneous restarts following momentary power interruptions without risking damage to driven equipment.